Photography students at The Sixth Form College, Solihull have completed a live brief for real client this term and last week they were commended for their work with a presentation from the client themselves. 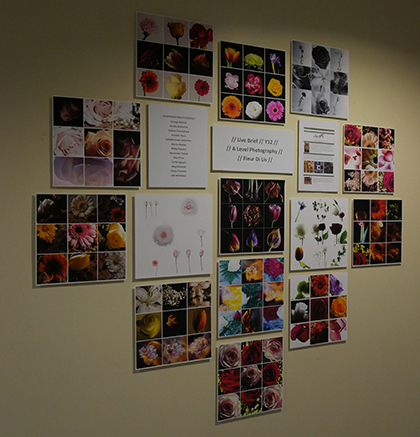 Kathryn Breit, from Solihull florists Fleur de Lis, visited the College to view the images that the students had produced of her product. The photographs had all been presented in a grid of nine images, as it would appear on the Fleur de Lis Instagram account. The first year A level Photography students all had different ideas and interpretations of the brief and used many difficult techniques. After very difficult deliberation, Kathryn awards the top prize to Chloe Timmins, while Amelia Bickerton was runner-up. Professional commercial photographer, Steve Carse, was also present for the presentation. He has visited the College a number of times in recent weeks to work with their students on this brief and he had a lot of useful advice for the students on their composition of their shots, the techniques they could use and the way they could lay out the images in a grid of nine. As well as having their photography featured on Instagram, a selection of photographs will also feature on a square window pane on the shop’s frontage. These images have also been printed and exhibited in College.